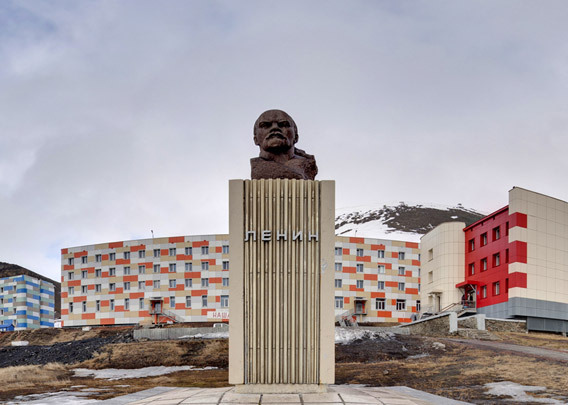 The Lenin-statue in Barentsburg is without any doubt an eye-catcher and a popular photo-magnet. Of course it is a relict of times long gone by, also in Barentsburg. Nobody there would like to have communism as under Lenin and Stalin back. But this massive bust is now there and has been photographed countless times by tourists as a symbol of the history and the – for many – exotic visual characteristics of the place. There is another Lenin-statue of the same kind in Pyramiden. Then there is yet another one in Longyearbyen. If you include the latter one although it is made of plastic, then the Barentsburg-Lenin is the third-northernmost one in the world. At least as far as I know. Does anyone know another Lenin that far north, for example in Franz Josef Land?